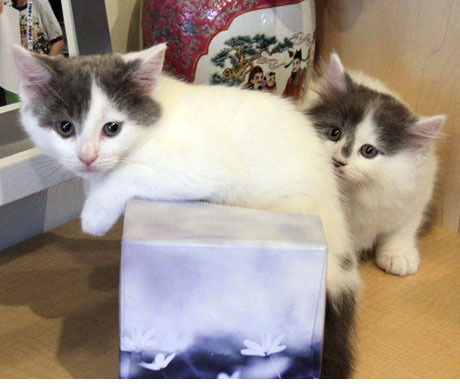 Meet my two new kittens – Audrey and Roberta. They are seven weeks old and have been exploring every nook and cranny in my home. They are curious about Benny the dog (he seems to like them a lot) and rightfully cautious about Madison the cat. They are endlessly entertaining. Enjoy! Hey, these aren’t those adorable kittens that caused the subway system shutdown a few weeks back, are they? No matter, they are beyond cute and I’m sure are livening up your home. So adorable! You must be kvelling. Theere is a book of photos here!!! I would put it on my coffee table…… These pictures deserve a very wide audience….!!! Oh my, just how cute are these two?!?!?!?!!? Love the one looking at Benny and the 2 of them asleep on each other. Glad it’s all working out. Cute–but will never quite be Fang!